A genome-wide association study for common gene variants and for rare mutations incriminates a microtubule motor protein in amyotrophic lateral sclerosis (ALS). The massive international collaboration spearheaded by John Landers of the University of Massachusetts Medical School in Worcester and Bryan Traynor of the National Institute on Aging in Bethesda, Maryland, identified a common missense variant and several rare loss-of-function (LOF) mutations in the kinesin family member 5A (KIF5A). It strengthens the argument that perturbations in cytoskeletal function play an important role in ALS, and offers a potential target for drug development. Six co-first authors, 200-plus secondary authors, and nine consortia collaborated to genotype nearly 100,000 subjects, including 25,000 with ALS. This largest ALS GWAS to date was published March 21 in Neuron. KIF5A has been on the radar for a while. It popped up as an ALS candidate gene in several previous analyses, but never reached genome-wide significance (Kenna et al., 2016). That changed when first authors Aude Nicolas, Alan Renton, Faraz Fagrhi, and Ruth Chia at NIH genotyped single nucleotide polymorphisms (SNPs) among 20,806 people with ALS and 59,084 controls. They uncovered five SNPs spanning several hundred kilobases on chromosome 12 that achieved genome-wide significance. Four occurred in noncoding DNA, with the fifth landing in the coding region for KIF5A, changing a proline at position 986 to a leucine. The leucine variant increased the risk of ALS a modest 1.38-fold. The association held up in an independent replication set and in a meta-analysis of combined genotyping data from 103,549 people. The GWAS also confirmed five previously identified ALS risk genes: TNP1, C9ORF72, TBK1, UNC13A, and C21ORF2. Kevin Kenna and Nicola Ticozzi in Landers’ group took a different tack by examining exome sequence data from familial ALS cases, searching for genes with unexpectedly high rates of loss-of-function (LOF) mutations that associated with the disease. In previous work, they and others used the same rare-variant analysis to identify TBK1 and NEK1 mutations that cause familial ALS (Feb 2015 news; Aug 2016 news). In the new study, which examined exomes of 1,138 familial cases and 19,494 controls, three genes achieved genome-wide significance: TBK1, NEK1, and KIF5A. Loss-of-function mutations in KIF5A increased the risk of ALS 40-fold. In all, Landers’ team identified 12 disease-associated mutations, all clustered at the splice junctions of exon 27 in the C-terminal region of the gene. The investigators predicted that these changes would cause exon skipping and a reading-frame change, altering the C terminal peptide sequence and disturbing the protein’s function. They confirmed aberrant KIF5A splicing in blood cells from two patients with different mutations, in agreement with recent work from Joachim Weishaupt’s lab in Ulm, Germany (Jan 2018 news; Brenner et al., 2018). They did not measure protein function. KIF5A mutations caused an early onset, slowly progressing form of ALS, the researchers found. The average ALS patient notices symptoms at about age 65 and survives just 20–36 months. People with KIF5A LOF mutations got sick in their 40s, but survived for nearly 10 years. How do the mutations cause ALS? Neurons depend on KIF5A for microtubule-dependent axonal transport of organelles, which falters in ALS. KIF5A knockout mice lose the ability to shuttle mitochondria up and down axons in motor neurons (Karle et al., 2012). Researchers have documented similar defects in ALS mouse models, and also in motor neurons derived from people carrying variants in the FUS gene that cause ALS (Oct 2017 news). Besides mitochondria, KIF5A transports other cargoes implicated in ALS, including RNA-containing granules harboring FUS and another RNA-binding protein, hnRNPA1. Interestingly, mutations in the N-terminus of the protein cause two other familial neuropathies: hereditary spastic paraplegia (SPG10) and Charcot-Marie-Tooth disease type 2 (CMT2). Now, it appears that C-terminal mutations give rise to a third, distinct outcome: ALS. “Seeing mutations in different domains that give different diseases—that was very surprising,” Landers told Alzforum. KIF5A’s N-terminal codes for a motor domain that contacts microtubules, while the C-terminus binds cargo. 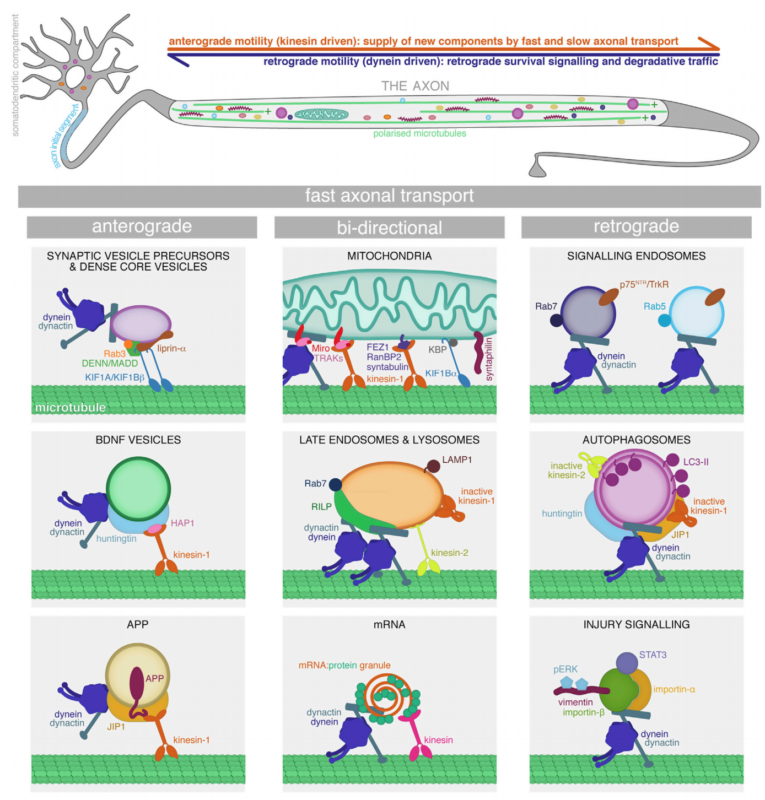 The authors speculate that loss of motor activity versus cargo binding could impede axonal transport in distinct ways, leading to different patterns of neurodegeneration. KIF5A joins a handful of other ALS genes involved in cytoskeletal dynamics, including profilin, TUBA4A, neurofilament, peripherin, and NEK1 (Jul 2012 news; Oct 2014 news; Al-Chalibi et al., 1999; Gros-Louis et al., 2004). Together, they highlight this system as a potential source for therapeutic targets. Landers told Alzforum his lab members are focusing their efforts on developing novel mouse models, and genetic and chemical screens based on KIF5A and other cytoskeletal genes they have uncovered (Oct 2016 news). Nicolas A, Kenna KP, Renton AE, Ticozzi N, Faghri F, Chia R, Dominov JA, Kenna BJ, Nalls MA, Keagle P, Rivera AM, van Rheenen W, Murphy NA, van Vugt JJ, Geiger JT, Van der Spek RA, Pliner HA, Shankaracharya, Smith BN, Marangi G, Topp SD, Abramzon Y, Gkazi AS, Eicher JD, Kenna A, ITALSGEN Consortium, Mora G, Calvo A, Mazzini L, Riva N, Mandrioli J, Caponnetto C, Battistini S, Volanti P, La Bella V, Conforti FL, Borghero G, Messina S, Simone IL, Trojsi F, Salvi F, Logullo FO, D’Alfonso S, Corrado L, Capasso M, Ferrucci L, Genomic Translation for ALS Care (GTAC) Consortium, Moreno CA, Kamalakaran S, Goldstein DB, ALS Sequencing Consortium, Gitler AD, Harris T, Myers RM, NYGC ALS Consortium, Phatnani H, Musunuri RL, Evani US, Abhyankar A, Zody MC, Answer ALS Foundation, Kaye J, Finkbeiner S, Wyman SK, LeNail A, Lima L, Fraenkel E, Svendsen CN, Thompson LM, Van Eyk JE, Berry JD, Miller TM, Kolb SJ, Cudkowicz M, Baxi E, Clinical Research in ALS and Related Disorders for Therapeutic Development (CReATe) Consortium, Benatar M, Taylor JP, Rampersaud E, Wu G, Wuu J, SLAGEN Consortium, Lauria G, Verde F, Fogh I, Tiloca C, Comi GP, Sorarù G, Cereda C, French ALS Consortium, Corcia P, Laaksovirta H, Myllykangas L, Jansson L, Valori M, Ealing J, Hamdalla H, Rollinson S, Pickering-Brown S, Orrell RW, Sidle KC, Malaspina A, Hardy J, Singleton AB, Johnson JO, Arepalli S, Sapp PC, McKenna-Yasek D, Polak M, Asress S, Al-Sarraj S, King A, Troakes C, Vance C, de Belleroche J, Baas F, Ten Asbroek AL, Muñoz-Blanco JL, Hernandez DG, Ding J, Gibbs JR, Scholz SW, Floeter MK, Campbell RH, Landi F, Bowser R, Pulst SM, Ravits JM, MacGowan DJ, Kirby J, Pioro EP, Pamphlett R, Broach J, Gerhard G, Dunckley TL, Brady CB, Kowall NW, Troncoso JC, Le Ber I, Mouzat K, Lumbroso S, Heiman-Patterson TD, Kamel F, Van Den Bosch L, Baloh RH, Strom TM, Meitinger T, Shatunov A, Van Eijk KR, de Carvalho M, Kooyman M, Middelkoop B, Moisse M, McLaughlin RL, Van Es MA, Weber M, Boylan KB, Van Blitterswijk M, Rademakers R, Morrison KE, Basak AN, Mora JS, Drory VE, Shaw PJ, Turner MR, Talbot K, Hardiman O, Williams KL, Fifita JA, Nicholson GA, Blair IP, Rouleau GA, Esteban-Pérez J, García-Redondo A, Al-Chalabi A, Project MinE ALS Sequencing Consortium, Rogaeva E, Zinman L, Ostrow LW, Maragakis NJ, Rothstein JD, Simmons Z, Cooper-Knock J, Brice A, Goutman SA, Feldman EL, Gibson SB, Taroni F, Ratti A, Gellera C, Van Damme P, Robberecht W, Fratta P, Sabatelli M, Lunetta C, Ludolph AC, Andersen PM, Weishaupt JH, Camu W, Trojanowski JQ, Van Deerlin VM, Brown RH Jr., van den Berg LH, Veldink JH, Harms MB, Glass JD, Stone DJ, Tienari P, Silani V, Chiò A, Shaw CE, Traynor BJ, Landers JE. Genome-wide Analyses Identify KIF5A as a Novel ALS Gene. Neuron. 2018 Mar 21;97(6):1268-1283.e6. PubMed. Kenna KP, van Doormaal PT, Dekker AM, Ticozzi N, Kenna BJ, Diekstra FP, van Rheenen W, van Eijk KR, Jones AR, Keagle P, Shatunov A, Sproviero W, Smith BN, van Es MA, Topp SD, Kenna A, Miller JW, Fallini C, Tiloca C, McLaughlin RL, Vance C, Troakes C, Colombrita C, Mora G, Calvo A, Verde F, Al-Sarraj S, King A, Calini D, de Belleroche J, Baas F, van der Kooi AJ, de Visser M, Ten Asbroek AL, Sapp PC, McKenna-Yasek D, Polak M, Asress S, Muñoz-Blanco JL, Strom TM, Meitinger T, Morrison KE, SLAGEN Consortium, Lauria G, Williams KL, Leigh PN, Nicholson GA, Blair IP, Leblond CS, Dion PA, Rouleau GA, Pall H, Shaw PJ, Turner MR, Talbot K, Taroni F, Boylan KB, Van Blitterswijk M, Rademakers R, Esteban-Pérez J, García-Redondo A, Van Damme P, Robberecht W, Chio A, Gellera C, Drepper C, Sendtner M, Ratti A, Glass JD, Mora JS, Basak NA, Hardiman O, Ludolph AC, Andersen PM, Weishaupt JH, Brown RH Jr, Al-Chalabi A, Silani V, Shaw CE, van den Berg LH, Veldink JH, Landers JE. NEK1 variants confer susceptibility to amyotrophic lateral sclerosis. Nat Genet. 2016 Sep;48(9):1037-42. Epub 2016 Jul 25 PubMed. Brenner D, Yilmaz R, Müller K, Grehl T, Petri S, Meyer T, Grosskreutz J, Weydt P, Ruf W, Neuwirth C, Weber M, Pinto S, Claeys KG, Schrank B, Jordan B, Knehr A, Günther K, Hübers A, Zeller D, German ALS network MND-NET, Kubisch C, Jablonka S, Sendtner M, Klopstock T, de Carvalho M, Sperfeld A, Borck G, Volk AE, Dorst J, Weis J, Otto M, Schuster J, Del Tredici K, Braak H, Danzer KM, Freischmidt A, Meitinger T, Strom TM, Ludolph AC, Andersen PM, Weishaupt JH. Hot-spot KIF5A mutations cause familial ALS. Brain. 2018 Jan 12; PubMed. Karle KN, Möckel D, Reid E, Schöls L. Axonal transport deficit in a KIF5A( -/- ) mouse model. Neurogenetics. 2012 May;13(2):169-79. Epub 2012 Apr 1 PubMed. Al-Chalabi A, Andersen PM, Nilsson P, Chioza B, Andersson JL, Russ C, Shaw CE, Powell JF, Leigh PN. 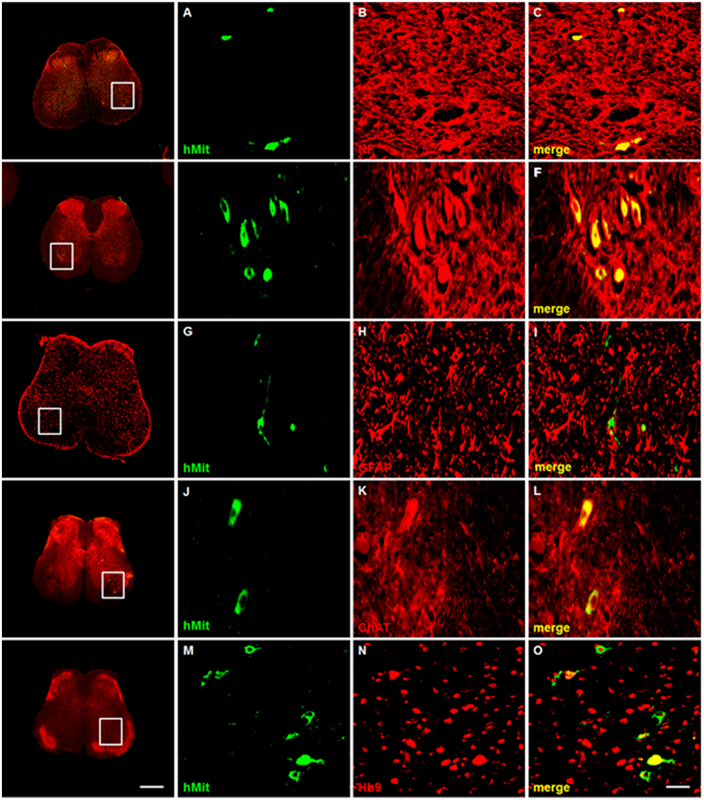 Deletions of the heavy neurofilament subunit tail in amyotrophic lateral sclerosis. Hum Mol Genet. 1999 Feb;8(2):157-64. PubMed. Gros-Louis F, Larivière R, Gowing G, Laurent S, Camu W, Bouchard JP, Meininger V, Rouleau GA, Julien JP. A frameshift deletion in peripherin gene associated with amyotrophic lateral sclerosis. J Biol Chem. 2004 Oct 29;279(44):45951-6. PubMed. De Vos KJ, Hafezparast M. Neurobiology of axonal transport defects in motor neuron diseases: Opportunities for translational research? Neurobiol Dis. 2017 Sep;105:283-299. PubMed. For people with ALS and their families, learn more about the gene and the collaborations that made this discovery possible by checking out this article.